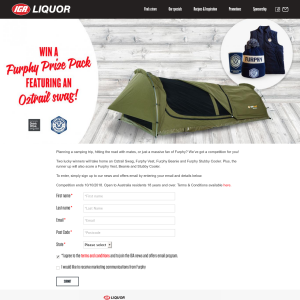 Planning a camping trip, hitting the road with mates, or just a massive fan of Furphy? We’ve got a competition for you! Two lucky winners will take home an Oztrail Swag, Furphy Vest, Furphy Beanie and Furphy Stubby Cooler. Plus, the runner up will also score a Furphy Vest, Beanie and Stubby Cooler. Competition ends 10/10/2018. Open to Australia residents 18 years and over. 2. Entry is open to Australian residents, who are over the age of 18 and who meet the entry requirements. 3. Entry to this competition is free and automatic upon entry via the lead gen ad on either the Cellarbrations, The Bottle-O or IGA Liquor Facebook page, or via the competition pages on the relevant websites within the competition period. Entrants must sign up to the news and offers program of the relevant retail store, and may opt in to share your details with Furphy. 4. Competition commences on 12/09/2018 at 9:00am AEST and closes on 10/10/2018 at 9.00 am AEST. 5. There will be two (2) major winners and one (1) runner-up winner in total across the Cellarbrations, The Bottle-O and IGA Liquor competitions. 8. The total prize pool is $895.70. 9. There will be one (1) draw held on the 11/10/2018. 10. Winners will be notified by email within two (2) days of the draw. 11.Winners will be notified via the email supplied at time of entry and must reply to the message and provide contact details to claim their prize. Winners will also need to provide photo proof of ID - either driver's licence or passport. 12. Any prizes that are not claimed within three (3) days of notification will be forfeited. An unclaimed prize draw will take place on 16/10/2018 if necessary. 13. Prizes cannot be transferred and cannot be redeemed for cash. There are no alternative prizes available. 14. The Promoter reserves the right to substitute any prize for another like prize of the same value. 15. The selection of winners will take place at 222a Glenmore Road, Paddington, NSW 2021. Skill plays no part in determining the winner. All entries are based on chance. 16. The Promoter’s decision is final on any situation including any not covered in these terms and conditions. Please note that the Promoter will not enter into any correspondence concerning any decisions made. 17. Employees (and the immediate family members) of the Participating Venues, agencies/companies directly associated with the conduct of this Promotion, the Promoter, its distributors, suppliers, subsidiary companies/businesses and associated companies and agencies are not eligible to enter. “Immediate family member” means any of the following: spouse, ex-spouse, de-facto spouse, child or step-child (whether natural or by adoption), parent, step-parent, grandparent, step-grandparent, uncle, aunt, niece, nephew, brother, sister, step-brother, step-sister or 1st-cousin. 18. The Promoter reserves the right to request winner’s proof of identity and age prior to prize delivery. 19. Prizes will be couriered to the winners. Once the prize has been sent by the promoter, the promoter takes no responsibility for the prize. 20. All entries become the property of The Promoters. All opt-in entries will be entered into a database and The Promoters may use the entrant’s names, addresses and telephone numbers for future promotional, marketing and publicity purposes in any media worldwide without notice and without any fee being paid unless otherwise advised by the entrant. By opting-in, entrants confirm that they allow their details to be used for this purpose. If entrants no longer consent to their details being used for future marketing purposes, the entrant should contact The Promoters on their details set out below. Any request to update, modify or delete the entrant’s details should be directed to The Promoters. 21. By entering this competition, entrants accept and acknowledge full responsibility for their decision to participate in this prize should they be chosen as winner. The winner and companions release the Promoter and other organisers, their related bodies corporate, affiliates, officers, agents and employees, from all liabilities, loss and damage of any kind arising at any time out of or in connection with the acceptance of, and participation in, the prize. Without limiting the foregoing, the released parties not be liable for any injury, sickness or death, property loss or damage or other direct or indirect loss or damage of any kind, howsoever sustained or incurred, in connection with or arising out of the tickets or any other aspect of the prize. The winner acknowledges that they have been warned that there is a possibility of an accident causing injury, death or property damage in accepting the prize. 24. The Promoter reserves the right in its sole discretion to disqualify any individual who the Promoter has reason to believe has breached any of these conditions, or engaged in any unlawful or other improper misconduct calculated to jeopardise the fair and proper conduct of the promotion. The Promoter’s legal rights to recover damages or other compensation from such an offender are reserved. 25. Promoter is Independent Brands Australia of 1 Thomas Holt Drive, Macquarie Park, NSW, 2113. 26. All entrants in this Competition release Facebook from all liabilities and claims arising out of or in connection with these terms and conditions. This Competition is in no way sponsored, endorsed or administered by, or associated with Facebook. In entering this competition the entrants are providing information to the Promoter and not to Facebook. 27. The promoter’s decision is final and the promoter will not enter into correspondence regarding the Competition result. 28. If for any reason any aspect of this Promotion is not capable of running as planned, including by reason of computer virus, communications network failure, bugs, tampering, unauthorised intervention, fraud, technical failure or any cause beyond the control of the Promoter, the Promoter may in its sole discretion cancel, terminate, modify or suspend the Promotion and invalidate any affected entries, or suspend or modify a prize, subject to State or Territory regulations.